Group hug sessions are in at San Diego Comic-Con. In one of the more fun, tongue-in-cheek installations at San Diego Comic-Con this year, Marvel Studios has been offering help for fans who were “traumatized” by the tragic end of Avengers: Infinity War, and emotional support for those “devastated” by the loss of (half of) their favorite superheroes. 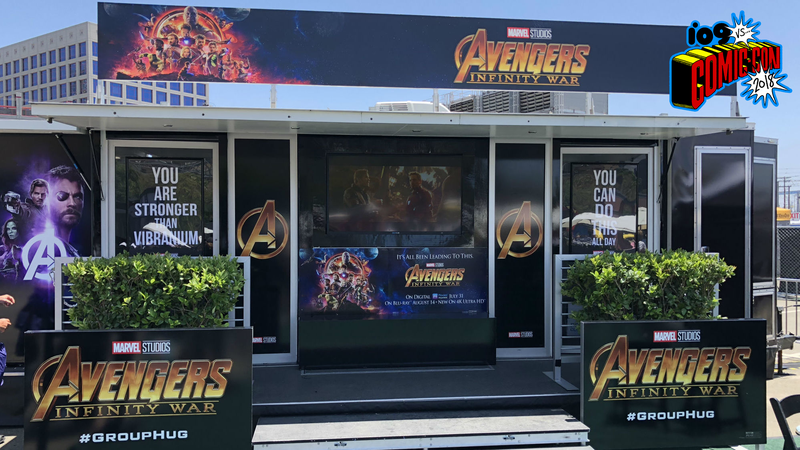 Fans can line up at a booth next to Petco Park in San Diego, put on a name tag, and enter an air-conditioned room where an actor who is there to talk with the group about their best memories from the Marvel Cinematic Universe. You get a donut, you watch a deleted scene from the Infinity War Blu-ray and then you get a t-shirt on the way out. Making the whole experience that much funnier too is both inside and out of the installation, there are posters offering fans positive affirmations in the form of classic MCU quotes. Here’s a gallery of all the posters. Of course, all of this is just to help promote the Avengers: Infinity War Blu-ray on August 14 and the digital copy on July 31. Still, as far as Comic-Con promotions go, this is definitely one of the cleverest we’ve seen in quite some time.